Our unremitting efforts to product range of high quality has enabled us to surpass our competitors in the market. 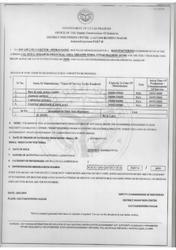 We lay utmost concern towards quality of products. The team of quality controllers apply stringent checks on the entire manufacturing process of our range of products. They check the components that are chosen to fabricate our range are of high quality and are procured from reliable vendors of the market. 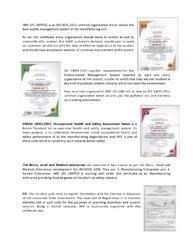 We make use various quality measures like CPRI and other leading European standards. With the support from our quality controllers, we offer a flawless range of Advanced Earthing Solutions & Lightning Protection Equipment. We being a client oriented organization, direct all our business endeavors towards providing client satisfaction of highest standards. The range of products offered by us are in strict compliance with user requirements. We strive to gauge the specific requirements of our clients and fabricate our range of products in accord to that. The wide distribution of network enables to deliver our products to clients spread across the globe. We also ensure that business dealings are hassle free and the products reach our clients within stipulated time frame. 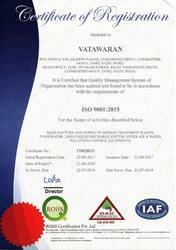 Receiving ISO 9001:2008 registration is a significant and positive milestone for JMV LPS Limited. 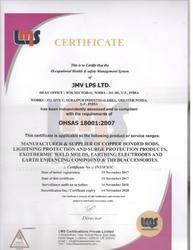 The JMV LPS Limited ISO 9001:2008 quality system covers all aspects of JMV's management and operations, including order entry, manufacturing, shipping/receiving, calibration and purchasing. All of the documentation related to JMV production processes, work and safety instructions, and office procedures has been written and documented in the ISO-approved format. We have also trained and certified in-house auditors who audit every aspect of our quality process. The ISO process also assures that all JMV LPS Limited employees receive (and remain current in) the training required to do their job in a professional and safe manner. Most importantly, the ISO 9001:2008 quality system assures JMV customers that JMV's management is committed to continuous improvement and customer satisfaction. 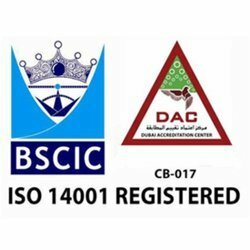 In bringing our quality system into conformance with ISO 9001:2008 requirements, JMV trained a team of in-house auditors from all areas of the company (for a total of six certified in-house auditors) who as a group are responsible for the continuous review of all aspects of the quality system. 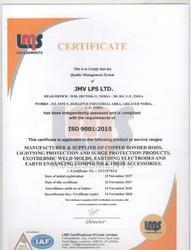 The ongoing efforts of the JMV LPS Limited auditors are then reviewed annually by an external accredited certification body that will confirm JMV is continuing to operate within the requirements of ISO 9001. Our unremitting efforts to product range of high quality has enabled us to surpass our competitors in the market. We lay utmost concern towards quality of products. The team of quality controllers apply stringent checks on the entire manufacturing process of our range of products. They check the components that are chosen to fabricate our range are of high quality and are procured.